If Baku is the potpourri of the old and new and Gabala is that beauty spot hidden in the mountains of Azerbaijan, Shaki is an old painting come alive. Cobbled streets, old buildings with exposed bricks, quaint coffee shops and tiny chai khanas, Shaki has held on to the old world charm that pulsed through Azerbaijan. The final destination of our two-day tour into the interiors of the land of flames – or should I say heights – of Azerbaijan, Shaki has a history of settlements almost 2,700 years old. Historians and the guide at the local museum say the first mention of this town has been found in literature from the medieval ages. Since then, Shaki or Sheki has been referred to as Sheke, Shaka, Shakki, Shakne, Shaken, Shakkan or Shekin. Tucked in the snug folds of the Caucasian mountain range’s southern side, Shaki is that picturesque town that you’ve been planning to visit for a few years now – seeped in the old, preserving traditions and a lifestyle passed on for generations while embracing the new technologies and developments, but only “the bit that is needed”. “It is good air and good space, why dirty place?” explained Seva, our host, who had taken us to Shaki. A three-hour drive from Baku, Shaki is a part of the World Historical Cities League and a member of the Board of the World Cities League. An old church stands proud along one of the roads. Walking along a street in Shaki. Driving towards village of Kish. Since we chose to drive down to Shaki from Gabala, the trip took us all of an hour and 30 minutes, including a stop at Xalxal waterfall. Counted among the best waterfalls of Azerbaijan, the natural miracle can be accessed off the usual route. Most Azeris are aware of this beautiful location that has been harnessed – in a manner of speaking – by locals who’ve built a hotel at the base. Snuggle into a thick jacket or a blanket and sip on Azeri tea as you enjoy the noise of the water rushing down the rocks and falling into the water. Or walk around, drink some fresh spring water (and bottle some up) before heading towards Shaki. The view at Xalxal Waterfalls. Raka and me at the waterfalls. What you can or cannot see in Shaki is a matter of perspective. You could spend a few hours in the town and drive back to Baku or stay overnight at the Karavansaray Hotel. Constructed in the early part of the 19th century as a space of accommodation on the Silk Road, the Karavansaray Hotel was the biggest at one point in time. Today, this beautiful building that is made more charming by the exposed bricks and arched passages is open for travellers, albeit of a different kind. The main area of the caravanserai. Note the two levels and the blue notches below. Yours truly attempting to get the ‘right frame’. The doors to all rooms be like this. Most of the rooms have a similar interior. The Karavansaray Hotel building has two levels – the upper level has around 600 rooms, most of which are thrown open to travellers even today. A domed roof and single beds lined up against the walls, the interiors are similar to the arrangements proffered by merchant travellers. Ditto for the lower level. An interesting feature of this caravanserai is the little notches at the base of the building covered with wooden doors. “This is where the traders stored their wares and locked them. If at any time they wanted to check on their goods, they had to open the door and use the ladder to climb down,” translated our driver after he questioned one of the maids on our behalf. And its most prominent feature, the dome. Perhaps this is where the traders gathered in the evenings to meet and greet their friends. The entrance to this hotel is through massive wooden doors that lead you into a cavernous foyer under a massive dome. I, for one, could almost feel the whispers of traders past who had probably passed through these doors exchanging pleasantries with fellow traders, hustling to store their wares before heading out to hunt for a meal. And no, I don’t know whether the square structures built in the courtyard are remains of the original caravanserai. But I prefer to believe they are, and they’ve seen traders puff on their hookahs, discussing trades or singing bawdy songs around fires, missing home and hearth. The Karavansaray Hotel is close to the most important – and beautiful as per Azeris – architectural specimen of Azerbaijan, the Palace of Shaki Khans or Sheki Xan Sarayi. Used as a summer residence by the Shaki Khans, the palace was built in 1797. Decade long restoration work from 1955-1965 and then again between 2002-2004 helped return the glamorous palace to its full glory. The gorgeous and glamorous Palace of Shaki Khans. One of the most colourful and fascinating aspects of this palace is its architecture and the liberal use of shebeke. What is shebeke? It is speciality art form of the region where a mosaic of coloured glasses is set in wooden latticework sans the use of nails or glue. Think of it like a puzzle – you fit in the coloured glasses in wooden grooves to create a masterpiece that looks like complicated lacework, only in glass. Shebeke on display at the museum at the Palace of Shirvanshahs, Baku. The second most interesting part of the palace is the fresco paintings that cover the walls of the palace rooms. These frescoes have reportedly been created by some of the most famous artistes that ancient Azerbaijan had produced. The plan of the summer palace is basic – three rectangular rooms are placed in a row. 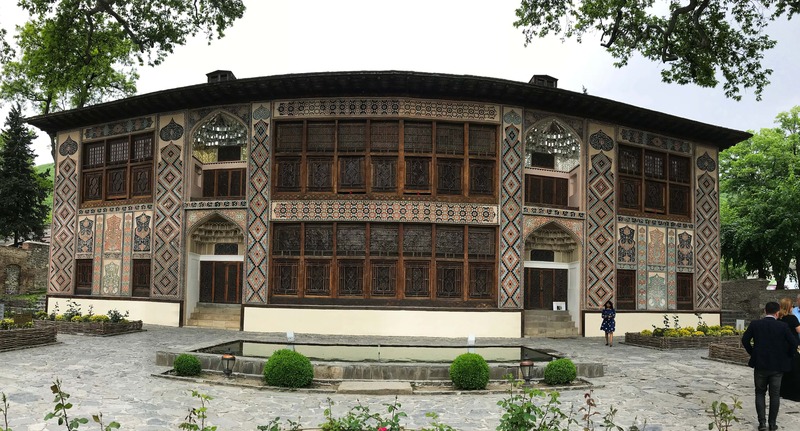 These rooms were used for consultation with the Khans, for guests and the women of the family. Unfortunately, photography inside the palace is now prohibited to “protect the paintings from flash lights” and to help “regulate the traffic flow”. “Travellers want to click photos, they create jam and then there is additional weight on the floor. That is not good,” said our guide in heavily accented English. The summer palace has seen two restoration phases. Not that it makes much of a difference. No photograph can capture the beauty and finesse of the paintings that cover the walls of the abode, nor can they capture the vivid plaster work that covers the exterior of the palace. There is much to be said about the aesthetic eye of the Azerbaijan nationals. * The local craft market opposite the palace where you can see artisans work with wood, make the shebeke and paint traditional art work. * Splurge on some handmade Shaki silk. The town has been renowned for silkworm breeding and silk manufacturing for several centuries. Piti, cooked in individual pots. And after you’ve done all of this, trek or drive towards the village of Kish to pop into the Caucasian Albanian Church of Kish that archaeologists have dated back to the 12th century! Standing proud but forlorn, this currently inactive church has survived several assaults and some natural calamities. The church, say the locals, had a second floor, an extended back and some more space in the years it was rebuilt, destroyed and eventually restored to its current state. The Church of Kish, an inactive yet popular spot. Inside the church is this representative altar. A peek at the crypts under the church. Evidence in the form of the objects recovered during excavations indicates the possibility of the church having been built on the resting place of a cult – perhaps dating back to 3000 BC. A collection of skeletons have also been discovered under the church. “The archaeologists chose not to disturb these resting grounds so viewing cases were built to give visitors a peek at what lies beneath. The crypt has skeletons that are as tall as 7 feet and some of these are women. The historians and scientists who worked here suggested these could have been warrior women who protected the cult. We will never know,” shared our guide at the church. If you enjoyed reading about Shaki, do check out my previous posts as I travelled through Azerbaijan. The article painted the beauty of Shaki very well! !